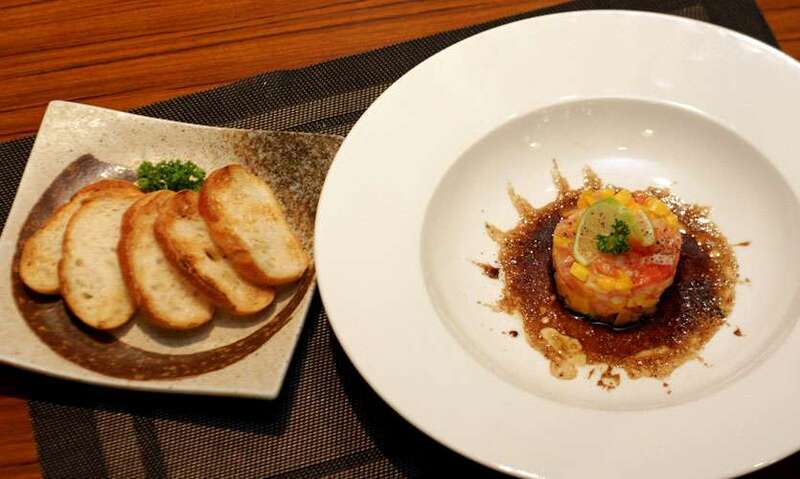 Kuuraku is a Japanese restaurant located at Park Street Mews with an array of delish traditional and modern Japanese cuisine. The first thing that hit me was that it had a traditional yet hip modern vibe. The top of the entrance was lined with sake caskets and they had lanterns with unique Japanese designs on them. 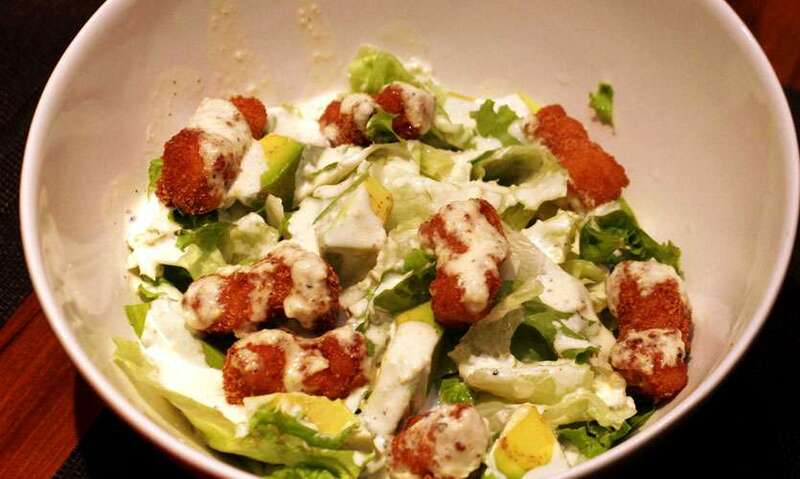 To start we were served Popcorn shrimp Caesar salad (Rs.1280), crispy nuggets of shrimp with chunks of avocado, iceberg lettuce topped off with their in-house salad dressing. The salad as a whole was quite tasty, the dressing is what gave it more flavour as it had a touch of spice which wasn’t too much but just right. 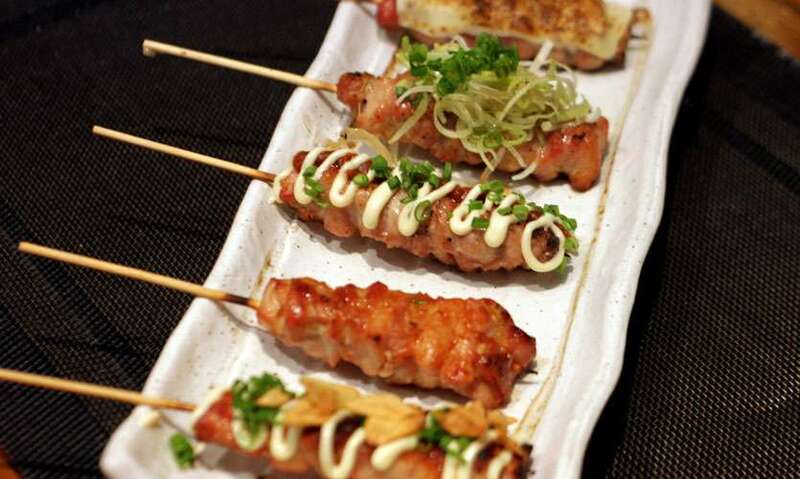 Next, we had skewers of different types: Tori Kush Course(chicken)(Rs.800), Buta Kushi Course (pork belly)(Rs.980) and Gyu Kushi Course(New Zealand steak)(Rs.1880). Each had 5 skewers with an array of sauces and toppings: grilled cheese, salt and leeks, Korean kara miso sauce and a garlic chili mayo. Personally, I really liked the kara miso sauce as it was creamy, sweet and spicy. 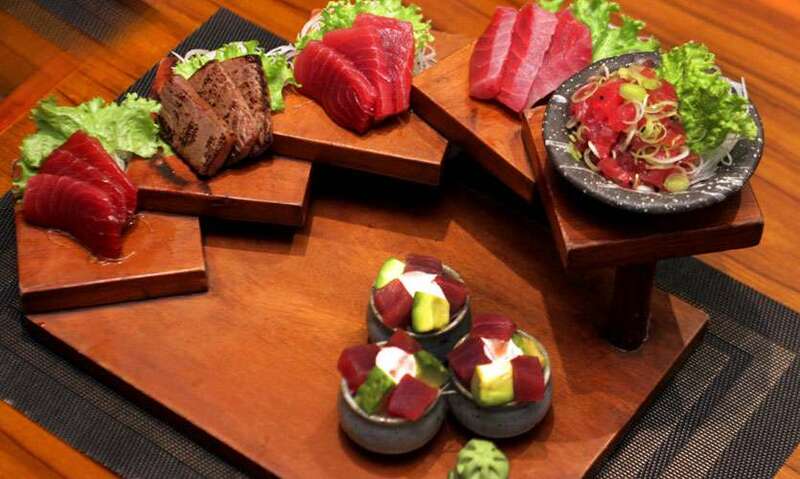 The Maguro Zanmai (Rs.2180), fresh Tuna sashimi served 6 different ways, one was marinated in soy sauce, one was lightly grilled on both sides, one was lightly flash fried, the next was diced cubes of tuna with avocado in a homemade spicy mayo, Cubes of Tuna with chopped green onion. This was beautifully presented (a very Instagram worthy picture). 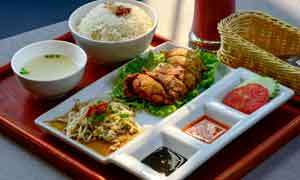 Next was the all famous, melting in your mouth, packed with flavour, Salmon sashimi (Rs.2180). Tropica Tartare (Rs.1180) or better known as the “Sushi Tower” was served next, this was an interesting mix between a fruit salad and salmon sashimi. The flavours were lovely, the sweetness of the mango and tomato and the distinct taste of the sashimi blended well over a toasted slice of baguette. 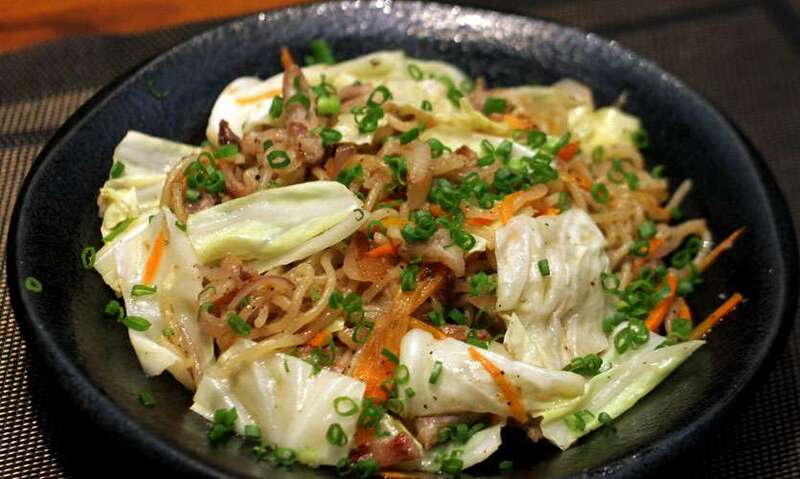 The waiter brought out the Shio Yakisoba Pork (Rs.1180). This was quite straightforward, a fried mixed noodle with sliced belly pork, personally, I would have preferred to have this with an accompanying dish with some gravy. 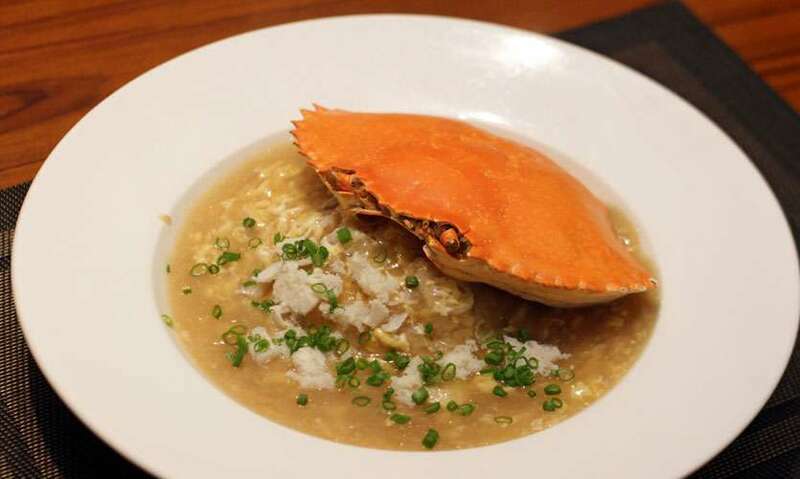 The Kan iAnake Chachan (Rs.1280) was a crowd pleaser and I think got a lot of heads turning, this egg fried rice in homemade crab sauce with chunks of delicious crab meat is served inside a crab shell. We also tried a mixed seafood stir-fry known as the Kaisen Teppanyaki (Rs.1380). 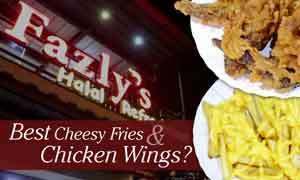 This would have gone well with the fried noodles as a side dish, didn’t quite enjoy it alone. 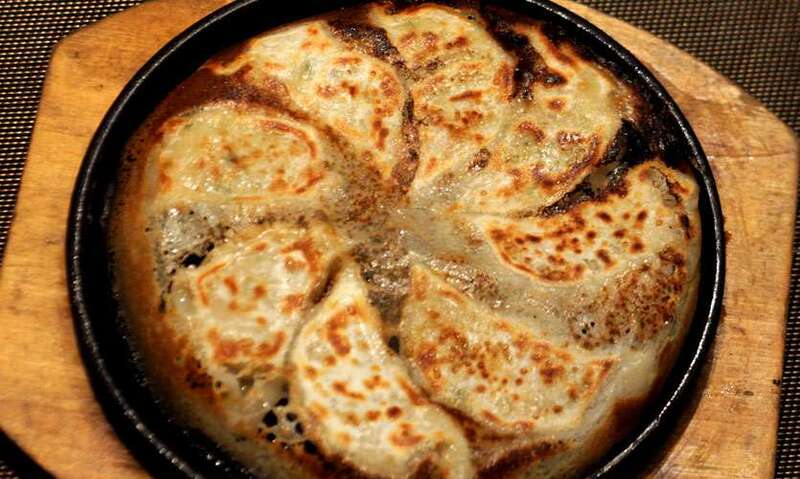 Tepan Gyoza (Rs.1380) was my favorite out of the three Teppan dishes we tried. This is apparently one of their top selling items, and rightfully so, it is juicy chicken Dumplings (Juicy is an understatement) covered with a crispy outer layer. 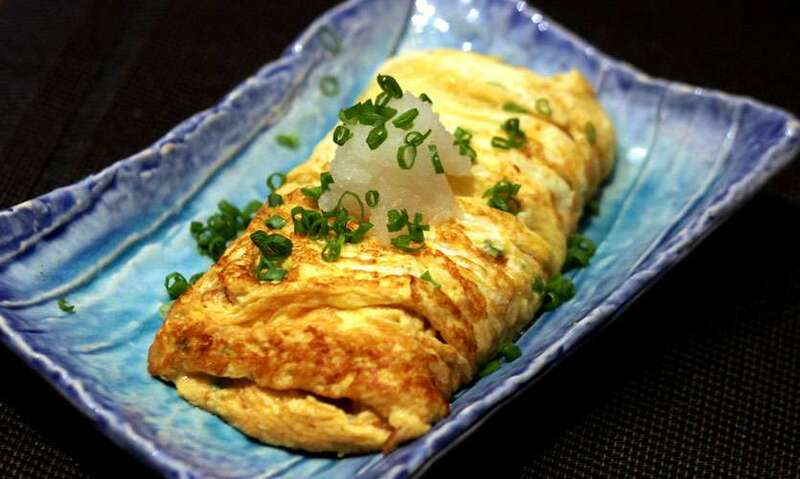 The Dashimaki Tamago (Rs.570) is basically a Japanese omelet made with soy sauce and Dashi sauce (Japanese fish sauce), this was my least favorite item and would have preferred to have it as a side dish. Our last but definitely not least dish was Katsuni Pork (Rs.1130), This was a crispy Pork Fillet on a bed of egg made with a Japanese spicy sweet sauce which gave the dish a lovely flavour. 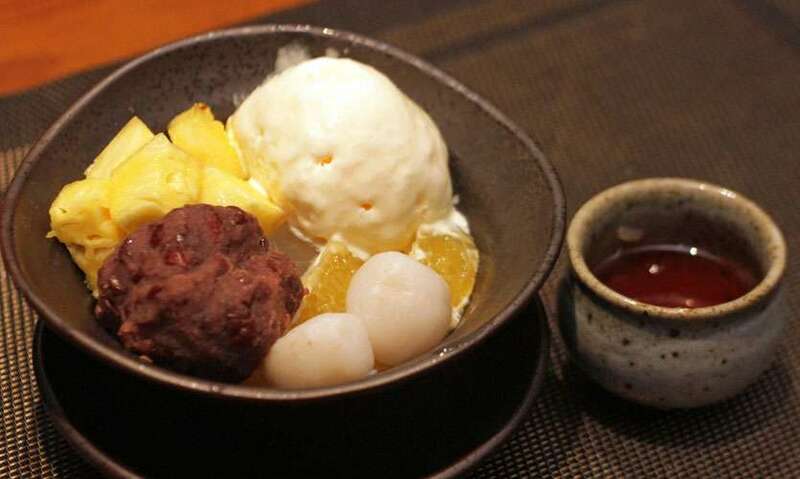 We did try a traditional Japanese dessert, Shirataan Mitsu which consisted of ice-cream, agar jelly, a bean paste, sticky rice flour dumplings and pineapple and was drizzled with kithulpani. To be very honest I didn’t really enjoy the dessert as much as I enjoyed the rest of the meal, however, it was nice to try something different for a change. A special mention to our waiter Kavinesh who did his job very well and was extremely obliging, to my surprise he seemed to know every dish and every name extremely well. Also a noteworthy mention to Mr. Chiba the Japanese head of operations who was very friendly and welcoming.